Taken on a rare day where there is a threat of snow in Charleston - hard to believe considering it was in the 70's only a few short weeks ago at Christmas. It's a few years since the last time we saw any snow - and that was just a few flurries. Moultrie Street runs right along the south side of Hampton Park. 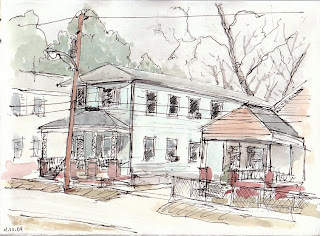 Great work Dave and welcome to Urban Sketchers. You have an excellent site here.